The Pioneer program was a series of robotic spacecraft that were sent on missions to explore the outer planets. 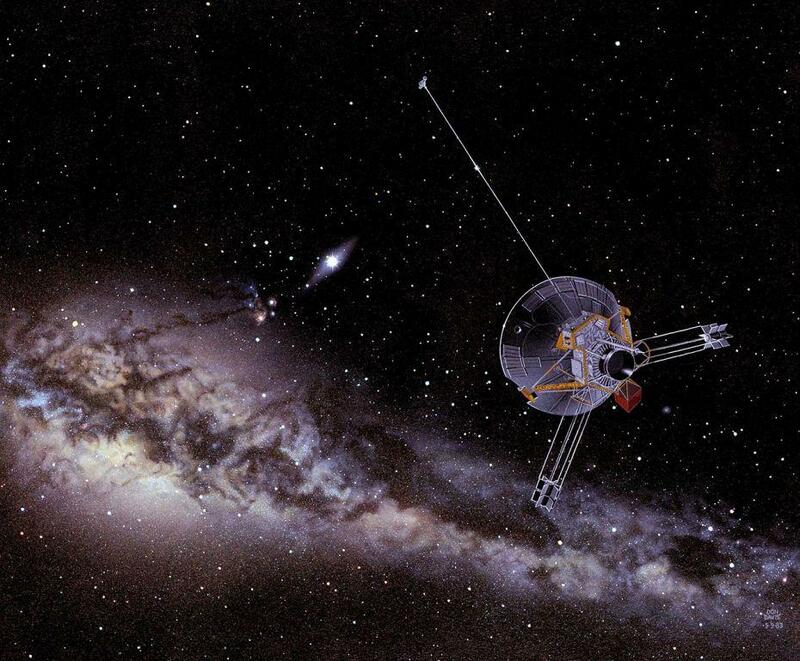 Pioneer 10 and Pioneer 11 are the best known as they were the first probes to be sent to the outer planets, and continued on, beyond the edge of the solar system. 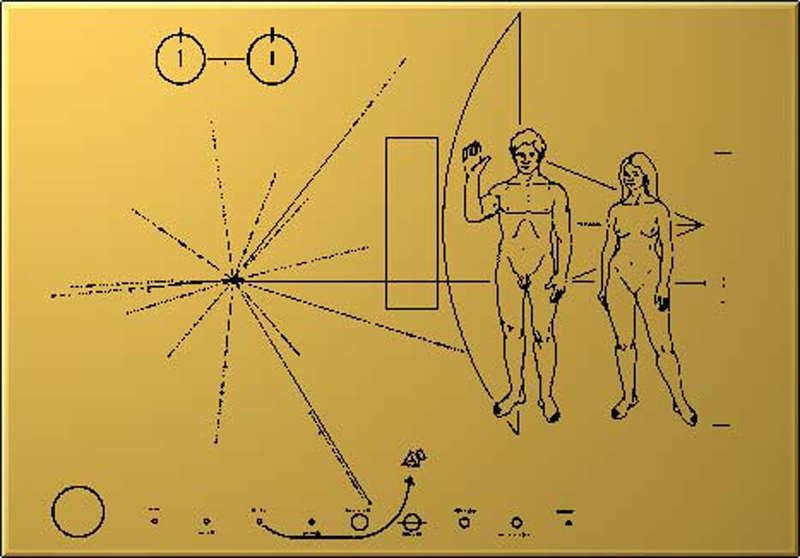 Each spacecraft carried a golden plaque depicting a human man and women, their size and the origin of the spacecraft. Status: Heading for near-by star systems! Facts About Pioneer 10 Mission! The Pioneer 10 spacecraft was the first to reach the escape velocity required to leave the solar system. 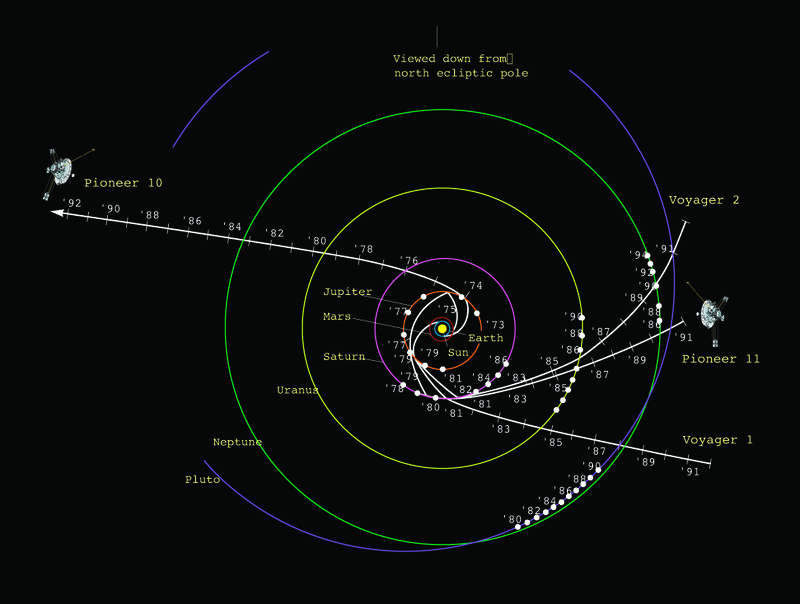 It became the first probe to traverse the main Asteroid belt and to flyby and study Jupiter. These achievements opened the way for exploration of the outer solar system! 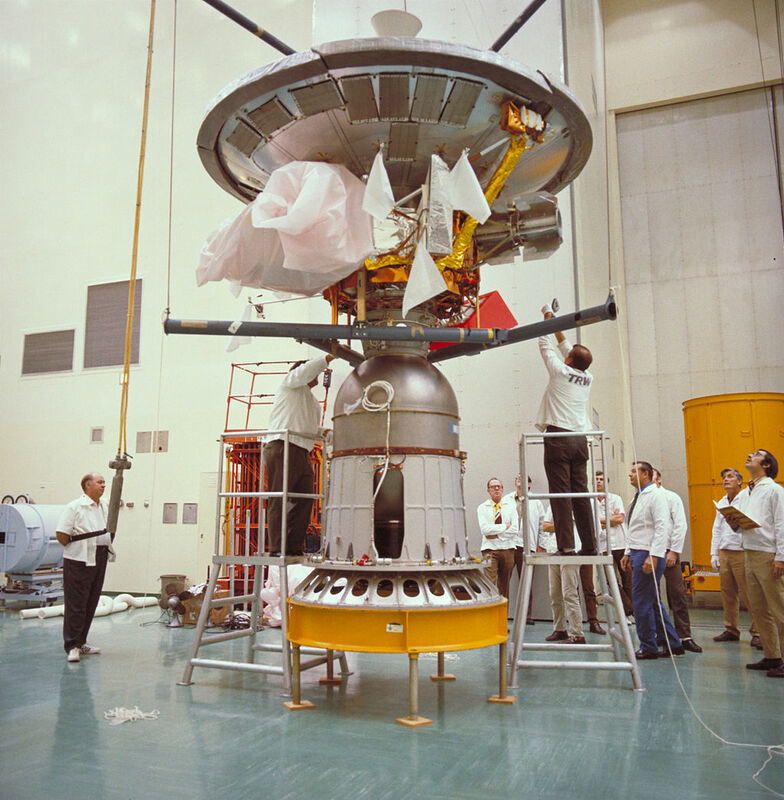 Pioneer 10 was powered by four radioisotope thermoelectric generators (RTGs) which would continue to provide power decades later, far longer than solar power would have. Click here to learn what an RTG is! The last, very weak signal, from Pioneer 10 was received by NASA's Deep Space Network on 23 January 2003 – 30 years after its launch! 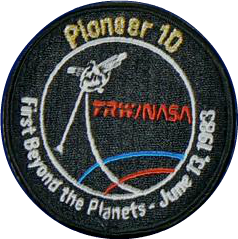 Pioneer 10 is one of 5 man-made spacecraft to leave the solar system along with Pioneer 11, Voyager 1, Voyager II and New Horizons. Pioneer will continue to coast silently into interstellar space, heading in the direction of the red star Aldebaran (which forms the eye of Taurus constellation) passing the star in about 2 million years time. Learn Interesting Info About The Pioneer 11 Mission! Both Pioneer spacecraft carried 12 scientific instruments to take pictures, study space and the planets they encountered (Jupiter & Saturn). The Pioneer probes were launch atop the Atlas/Centaur 3-stage rocket. 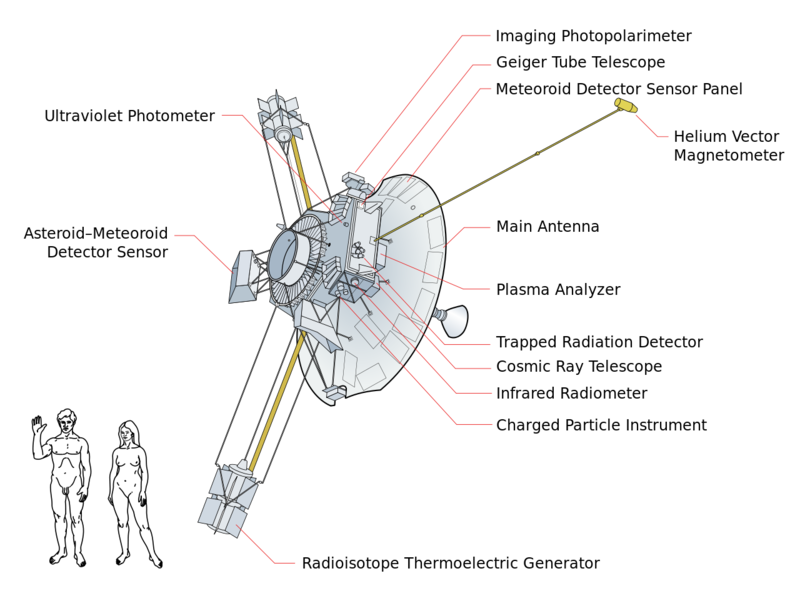 Pioneer 11 was launched a year after its twin Pioneer 10, and followed its path initially to Jupiter, but would then head in the opposite direction. During the close flyby of Jupiter the Pioneer 11 spacecraft accelerated to 175,000 km/hr (110,000mph) – that’s over 55 times faster than a speeding bullet! After Jupiter, Pioneer 11 would make the first close up observations of Saturn. During its flyby of Saturn, the probe discovered two new moons and studied the planet in detail. The spacecraft is now heading toward the constellation of Aquila and will pass near one of its stars in about 4 million years! What will life on Earth be like then I wonder! At the request of the famous astronomer and astrophysicist Carl Sagan, a golden plaque was prepared and attached to the struts of the pioneer spacecraft in case any intelligent alien life form intercepted the craft in the future. The plaque shows an average sized man and woman standing in front of the outline of the spacecraft's antenna (for size reference) with the man's hand raised in a gesture of goodwill. It also shows the location of Earth in relation to our Sun and the Sun’s location in relation to 14 pulsar stars within our galaxy. The key to translating the plaque lies in understanding the breakdown of the most common element in the universe - hydrogen. The plaque also displays a key showing the element in the left-hand corner, in schematic form, so any alien from a scientifically educated civilization would be able to translate the message.